Powerful foods have powerful origins. 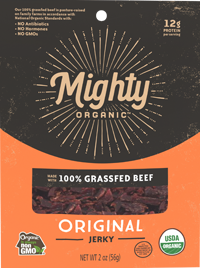 Starting with respect for the land and animals, at Mighty, we make sure every part of the process is done with integrity and with an eye on the quality and taste of the finished product. Only the best meats, fruits, veggies, nuts and seeds make it into our snacks. Our beef comes from 100% grass-fed, organic cattle raised on family farms in the Channel Country of the Australian Outback. Temperatures in Australia rarely drop below freezing, which means farmers can keep cows in their pastures all year round. The geography of Australia makes it easy to graze cattle throughout the year, which contributes to our farmers' economic stability. Australian beef tastes really, really good thanks in part to the country-wide adoption of organic practices, and the native grasses that exist nowhere else. Our farmers operate a cooperative of family farms that work together to take care of everyone who has a hand in the process. That means meat you can feel good about tearing into. Our chicken comes from organic farms all over the United States, all members of our farmer-owned cooperative. We always source our bacon, apples, cranberries, sunflower seeds and other ingredients from organic farmers whose growing practices align with our commitment to doing food sustainably. That means better tasting meat, and a healthier environment.